Cal men’s basketball (15-8, 5-5 Pac-12) has yet to lose a game at Haas Pavillion this year, and a hot shooting performance by the Bears ensured that streak would continue as Cal dispatched Stanford (11-10, 4-6) 76-61 on Saturday. The Cardinal have now lost four of their last five games. 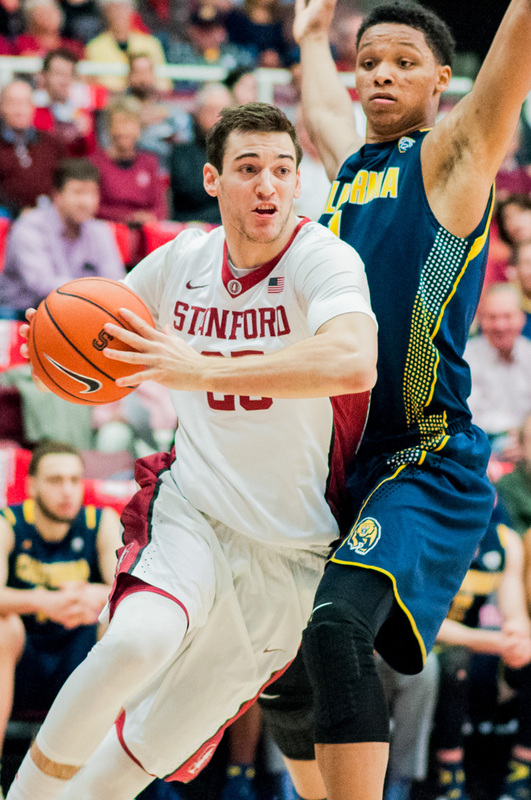 Stanford struggled to consistently make stops against an energized Bears side. Cal shot a tremendous 53.7 percent from the field and took 37 free throw attempts as the Stanford defense aggressively fought to contest the Bears’ field goal attempts. Stanford struggled in particular in the interior, with Cal out-rebounding the Cardinal 41-25 and executing well enough in the pick and roll to drive to the basket seemingly at will. With sophomore Reid Travis still out and sophomore Michael Humphrey leaving the game in the first half with an injury, backup bigs Josh Sharma and Grant Verhoeven struggled to pick up the slack, both fouling out early in the second half. Cal’s best offense came from the bench, with junior Jordan Mathews leading all scorers with 18 points and sophomore Kameron Rooks chiming in with a double-double. The team finished 9-of-17 from the 3-point line, a statistic which in some respects understates its proficiency given that it made just one of its final five attempts when the game’s outcome had largely been decided. Senior Rosco Allen finished with 16 points for Stanford, all of which came in the second half, while sophomore Dorian Pickens joined him in double figures with 10. The team’s offensive struggles were in stark contrast to when the teams met a month ago, when Stanford topped its rival 77-71 and had four different players score at least 11 points. The loss puts Stanford on a three-game losing streak, its longest since it fell consecutively to Villanova, SMU and Saint Mary’s in November, and breaks a four-game Cardinal winning streak over its archrival that dated back to Jan. 2, 2014. Stanford will now return home for a series against Oregon and Oregon State. The Cardinal won their only conference road game of the season against the Beavers in January and will look to reestablish their competitiveness in Pac-12 play with a home victory this week. The team faces off against OSU this Thursday at 8 p.m.